I have born and raised in Tsuen Wan except I have spent some years in Canada for education, that is the place I know most. Tsuen wan is a aging area especially in the downtown area, with quite a lot of old buildings and senior on the street, they become the character of this town. 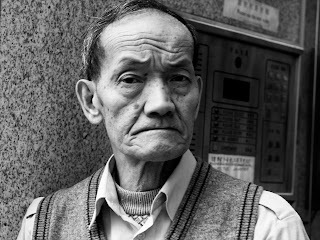 As a result, I had taken a small series of close up portraits to bring up some characteristic of the district I live. Since I had used the CV25/0.95 Manual focus lens for candid shots most of the time in the last 2 weeks, back to auto focus is just another experience. Oly 45/1.8 has a reputation is such a fast focus and sharp lens, of course the sharpness have shown in this series, the most important thing is it helps me to get closer to the subject then compose my image and shoot. Therefore, All the shots had shooting distances around 1.2-1.6m. Close up shots really can show the facial expression of the subject and create drama. Really want to say thx to my CV25/0.95, it force me to spend time on focusing technique and it also give me balls to shoot closer when I'm using AF lens.